The event will bring together MT and HT researchers, users and providers of tools, and users and providers of manual and automatic evaluation methodologies currently used for the purpose of evaluating HT and MT systems. The key objective of the workshop is to initiate a dialogue and discuss whether the current approach involving a diverse and heterogeneous set of data, tools and evaluation methodologies is appropriate enough or if the community should, instead, collaborate towards building an integrated ecosystem that provides better and more sustainable access to data sets, evaluation workflows, approaches and metrics and supporting processes such as annotation, ranking and so on. Current MT/HT evaluation approaches, both automatic and manual, are characterised by a high degree of fragmentation, heterogeneity and a lack of interoperability between tools and data sets. As a consequence, it is difficult to reproduce, interpret, and compare evaluation results. The main objective of this workshop is to bring together researchers working on MT and HT evaluation, including providers and users of tools or evaluation approaches (including metrics and methodologies) as well as practitioners (translators, users of MT, LSPs etc.). The workshop is meant to stimulate a dialogue about the commonalities, similarities and differences of the existing solutions in the three areas (1) tools, (2) methodologies, (3) data sets. A key question concerns the high level of flexibility and lack of interoperability of heterogeneous approaches, while a homogeneous approach would provide less flexibility but higher interoperability. How much flexibility and interoperability does the MT/HT research community need? How much does it want? Another question involves the requirements to establish evaluation methods as actual viable tools. Automatic metrics are used because they are fast, and they correlate sufficiently with human judgement. The manual metric used in WMT (5-way rankings) has been refined to obtain statistically significant results in a reliable and efficient way. However, concerns remain about consistency and agreement in judgements, time needed to carry out judgements, and reliability of sampling methods. Other methods (post-editing impact, understandability tests, (linguistic) error analyses) require even more effort to test their viability. For example, post-editing speed is arguably an intuitive evaluation metric, but inter-translator variability is too high to make a practical use of this metric in a straightforward way. We invite contributions on the topics mentioned above and any related topics of interest. Please submit your papers at https://www.softconf.com/lrec2016/MTEVAL/ before the deadline of 15 February 2016 18 February 2016, 12:00 GMT+1 (deadline extended). Accepted papers will be presented as oral presentations or as posters. All accepted papers will be published in the workshop proceedings. Papers should be formatted according to the stylesheet soon to be provided on the LREC 2016 website and should not exceed 8 pages, including references and appendices. Papers should be submitted in PDF format through the URL mentioned above. When submitting a paper, authors will be asked to provide essential information about resources (in a broad sense, i.e., also technologies, standards, evaluation kits, etc.) that have been used for the work described in the paper or are a new result of your research. Moreover, ELRA encourages all LREC authors to share the described LRs (data, tools, services, etc.) to enable their reuse and replicability of experiments (including evaluation ones). Summary – final discussion – next steps: towards an integrated ecosystem? Acknowledgments: This work has received funding from the EU’s Horizon 2020 research and inno- vation programme through the contracts CRACKER (grant agreement no. : 645357) and QT21 (grant agreement no. : 645452). This workshop is an initiative jointly organised by the EU projects CRACKER and QT21 with support of the Cracking the Language Barrier federation. LREC 2016 - 10th International Conference on Language Resources and Evaluation is organised by ELRA with the support of CNR-ILC and will be held at the Grand Hotel Bernardin Conference Center in Portorož, Slovenia, from 23 to 28 May 2016. 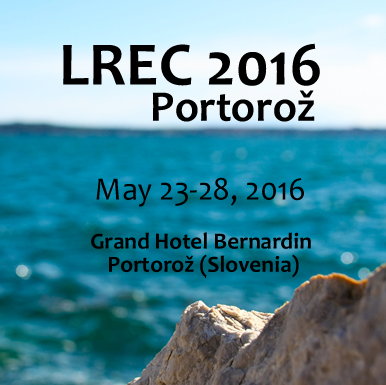 LREC 2016 Workshops and Tutorials will be held in the same location on 23, 24 and 28 May 2016. This paper proposes a fine-grained flexible analysis methodology to reveal the residual difficulties of a high-quality Statistical Machine Translation (SMT) system. This proposal is motivated by the fact that the traditional automated metrics are not enough informative to indicate the nature and reasons of those residual difficulties. Their resolution is however a key point towards improving the high-quality output. The novelty of our approach consists in diagnosing Machine Translation (MT) performance by making a connection between errors, the characteristics of source sentences and some internal parameters of the system, using traces of Post-Edition (PE) operations as well as Quality Estimation (QE) techniques. Our methodology is illustrated on a SMT system adapted to the medical domain, based on a high quality English-French parallel corpus of Cochrane systematic review abstracts. Our experimental results show that the main difficulties that the system faces are in the domains of term precision and source language syntactic and stylistic peculiarities. We furthermore provide general information regarding the corpus structure and its specificities, including internal stylistic varieties characteristic of this sub-genre. The shared translation task of the Workshop of Statistical Machine Translation (WMT) is one of the key annual events of the field. Participating machine translation systems in WMT translation task are manually evaluated by relatively ranking five candidate translations of a given sentence. This style of evaluation has been used since 2007 with some discussion on interpreting the collected judgements but virtually no insight into what the annotators are actually doing. The scoring task is relatively cognitively demanding and many scoring strategies are possible, influencing the reliability of the final judgements. In this paper, we describe our first steps towards explaining the scoring task: we run the scoring under an eye-tracker and monitor what the annotators do. At the current stage, our results are more of a proof-of-concept, testing the feasibility of eye tracking for the analysis of such a complex MT evaluation setup. Currently available alignment tools and procedures for marking-up alignments overlook non-contiguous multiword units for being too complex within the bounds of the proposed alignment methodologies. This paper presents the CLUE-Aligner (Cross-Language Unit Elicitation Aligner), a web alignment tool designed for manual annotation of pairs of paraphrastic and translation units, representing both contiguous and non-contiguous multiwords and phrasal expressions found in monolingual or bilingual parallel sentences. Non-contiguous block alignments are necessary to express alignments between multiwords or phrases, which contain insertions, i. e., words that are not part of the multiword unit or phrase. CLUE-Aligner also allows the alignment of smaller individual or multiword units inside non-contiguous multiword units. The interactive web application was developed under the scope of the eSPERTo project, which aims to build a linguistically enhanced paraphrasing system. However, a tool for manual annotation of alignment and for visualization of automatic phrase alignment can prove useful in human and machine translation evaluation. Quality estimation for machine translation is an important task. The standard automatic evaluation methods that use reference translations cannot perform the evaluation task well enough. These methods produce low correlation with human evaluation for English-Hungarian. Quality estimation is a new approach to solve this problem. This method is a prediction task estimating the quality of translations for which features are extracted from only the source and translated sentences. Quality estimation systems have not been implemented for Hungarian before, thus there is no such training corpus either. In this study, we created a dataset to build quality estimation models for English-Hungarian. We also did experiments to optimize the quality estimation system for Hungarian. In the optimization task we did research in the field of feature engineering and feature selection. We created optimized feature sets, which produced better results than the baseline feature set. The WMT evaluation campaign (http://www.statmt.org/wmt16) has been run annually since 2006. It is a collection of shared tasks related to machine translation, in which researchers compare their tech- niques against those of others in the field. The longest running task in the campaign is the translation task, where participants translate a common test set with their MT systems. In addition to the transla- tion task, we have also included shared tasks on evaluation: both on automatic metrics (since 2008), which compare the reference to the MT system output, and on quality estimation (since 2012), where system output is evaluated without a reference. An important component of WMT has always been the manual evaluation, wherein human annotators are used to produce the official ranking of the systems in each translation task. This reflects the belief of the WMT organizers that human judgement should be the ultimate arbiter of MT quality. Over the years, we have experimented with different methods of improving the reliability, efficiency and discriminatory power of these judgements. In this paper we report on our experiences in running this evaluation campaign, the current state of the art in MT evaluation (both human and automatic), and our plans for future editions of WMT. Evaluation campaigns are the most successful modality for promoting the assessment of the state of the art of a field on a specific task. Within the field of Machine Translation (MT), the International Workshop on Spoken Language Translation (IWSLT) is a yearly scientific workshop, associated with an open evaluation campaign on spoken language translation. The IWSLT campaign, which is the only one addressing speech translation, started in 2004 and will feature its 13th installment in 2016. Since its beginning, the campaign attracted around 70 different participating teams from all over the world. In this paper we present the main characteristics of the tasks offered within IWSLT, as well as the evaluation framework adopted and the data made available to the research community. We also analyse and discuss the progress made by the systems along the years for the most addressed and long-standing tasks and we share ideas about new challenging data and interesting application scenarios to test the utility of MT systems in real tasks. Language service providers (LSPs) who want to make use of Machine Translation (MT) have to fight on several fronts. The skepticism within the language industry is still very high: End-customers worry about paying too much for translations that no human has interfered with. Translators refuse to get in- volved in post-editing activities because they fear that MT will take away their actual work, rendering themselves useless on the long run. And competitors try to outperform each other by either spoiling the market with low-quality MT offered on dumping rates or declining MT altogether for being inap- propriate for commercial usage. This paper seeks to show that well-defined quality metrics can help all stakeholders of the translation market to specify adequate benchmarks for the desired translation quality, to use an agreed-upon consistent mark-up and to evaluate translation quality – MT and human translation output alike – accordingly. As a by-product, this professionally error-annotated MT output will help researchers to further improve MT quality, which in turn will help to make this technology more popular in the industry. Translation quality evaluation (QE) has gained significant uptake in recent years, in particular in light of increased demand for automated translation workflows and machine translation. Despite the need for innovative and forward-looking quality evaluation solutions, the technology landscape remains highly fragmented and the two major consituencies in need of collaborative and ground-breaking technology are still very divided. This paper will demonstrate that closer cooperation between users of QE technology in research and industry to create a holistic but highly adaptable environment for all aspects of the translation improvement process, most signficantly quality evaluation, can lead the way to novel and ground-breaking achievements in accelerated improvement in machine translation results. The situation on the interoperability of Natural Language Processing software is outlined through a use- case on Quality Estimation of Machine Translation output. The focus is on the development efforts for the QUALITATIVE tool, so that it integrates a multitude of state-of-the-art external tools into one single Python program, through an interoperable framework. The presentation includes 9 approaches taken to connect 25 external components, developed in various programming languages. The conclusion is that the current landscape lacks important interoperability principles and that developers should be encouraged to equip their programs with some of the standard interaction interfaces. This article describes experiments a set of experiments designed to test whether reference-based machine translation evaluation methods (represented by BLEU) (a) measure translation “quality” and (b) whether the scores they generate are reliable as a measure for systems (rather than for particular texts). It considers these questions via three methods. First, it examines the impact of changing reference translations and using them in combination on BLEU scores. Second, it examines the internal consistency of BLEU scores, the extent to which reference-based scores for a part of a text represent the score of the whole. Third, it applies BLEU to human translation to determine whether BLEU can re- liably distinguish human translation from MT output. The results of these experiments, conducted on a Chinese>English news corpus with eleven human reference translations, bring the validity of BLEU as a measure of translation quality into question and suggest that the score differences cited in a considerable body of MT literature are likely to be unreliable indicators of system performance due to an inherent imprecision in reference-based methods. Although previous research has found that human quality judgments largely correlate with BLEU, this study suggests that the correlation is an artefact of experimental design rather than an indicator of validity. The paper showcases the MT-ComparEval tool for qualitative evaluation of machine translation (MT). MT-ComparEval is an open-source tool that has been designed in order to help MT developers by providing a graphical user interface that allows the comparison and evaluation of different MT en- gines/experiments and settings. The tool implements several measures that represent the current best practice of automatic evaluation. It also provides guidance in the targeted inspection of examples that show a certain behavior in terms of n-gram similarity/dissimilarity with alternative translations or the reference translation. In this paper, we provide an applied, “hands-on” perspective on the actual usage of MT-ComparEval. In a case study, we use it to compare and analyze several systems submitted to the WMT 2015 shared task. Machine Translation quality is evaluated using metrics that utilize human translations as reference materials. This means that the existing methods do not allow to predict the quality of Machine Translation if no human translations of the same material exist. To use Machine Translation in the translation industry, it is essential to have a metric that allows to evaluate the quality of a newly created Machine Translation in order to decide whether or not it can increase productivity. As a translation company that uses Statistical Machine Translation to generate translation memories for many projects, we decided to develop a metric that can predict its usability on a project basis. This metric, called CMT, is a combination of human assessment and statistics comparable to existing metrics. Our investigations showed that the mean difference between CMT and BLEU is 9.10, and between CMT and METEOR it is 9.69, so it correlates with the existing metrics in more than 90%. CMT is very easy to use and allows to evaluate each translation memory, regardless of its size, in 5 minutes without any reference material. Since the advent of modern statistical machine translation (SMT), much progress in system perfor- mance has been achieved that went hand-in-hand with ever more sophisticated mathematical models and methods. Numerous small improvements have been reported whose lasting effects are hard to judge, especially when they are combined with other newly proposed modifications of the basic models. Often the measured enhancements are hardly visible with the naked eye and two performance advances of the same measured magnitude are difficult to compare in their qualitative effects. We sense a strong need for a paradigm in MT research and development (R&D), that pays more attention to the subject matter, i. e., translation, and that analytically concentrates on the many different challenges for quality translation. The approach we propose utilizes the knowledge and experience of professional translators throughout the entire R&D cycle. It focuses on empirically confirmed quality barriers with the help of standardised error metrics that are supported by a system of interoperable methods and tools and are shared by research and translation business.